This beautifully renovated, beachfront condo in the gallery-rich East End of Provincetown features a patio and gardens overlooking the bay (and a private walkway to the sandy beach) where you can contentedly stay in to grill/cook, watch a movie, play board games, or take a short stroll to all the restaurants, shops and entertainment that Provincetown has to offer! And it's dog friendly too! The location is as good as it gets, across the street from the renowned Rice Polak Gallery and a few doors down from the celebrated restaurant, The Mews. Also steps away and across the street from the Provincetown Art Association and Museum, is Angel Foods, a gourmet grocery store with specialty sandwiches, prepared foods, imported cheeses, daily baked scones, baguettes and bagels, fresh produce and meats, and wines galore. You will never be short of superb food or art options! Race Point and Herring Cove beaches are a three mile bike and car-friendly ride away. The condo has WiFi, a flatscreen TV with Netflix streaming, and air conditioning. The full kitchen offers a coffee bean grinder, toaster, coffee maker, full set of pots and pans, and new appliances (including a washer and dryer), to make you feel right at home in this very special getaway. The sliding glass doors open to the patio - which has a Webber grill, all you need to comfortably cook and entertain - with the beach beyond. 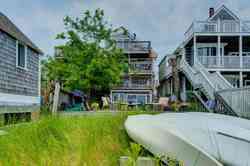 Plan a Cape Cod vacation full of sunshine, surf, and unforgettable entertainment - reserve your stay in this Provincetown condo today! (Note: while the kitchen/dining part of the home has a standard ceiling height of 8+ ft., the front living room, bathroom and bedroom are a shorter 6'4" ceiling height.) SUMMER RATES FROM $3,000/WEEK PLUS TAX 4th of JULY, BEAR WEEK, CARNIVAL WEEK: $3,500.00 PLUS TAX EMAIL BILLY FOR MORE DETAILS! Click HERE to check availability calendar! This spacious 1 bedroom apartment is located in a charming antique home in Provincetown's East End Gallery District. The second floor unit is filled with light from the water view bay windows. Sit and gaze out over the neighboring rooftops to the bay or watch the action on Commercial Street below. Beautiful pine floors and high ceilings throughout. Off the living/dining room are the bedroom, cozy kitchen and remodeled bathroom. Large, exclusive deck off the kitchen. AC throughout. Path to bay beach directly across the street! This is a dog-friendly rental. No on site parking but, lot a block away charges reasonable daily/weekly rates. Weekly summer rates from $1,900.00 PLUS 14.45% TAX. Spring rates from $800.00-$1,175.00 plus 14.45% tax. Fall rates from $800.00 - $1,350.00 plus 14.45% tax. EMAIL BILLY now for more details! Click HERE to check availability!